No need to look any further for the perfect desktop for your computer, We have it here! 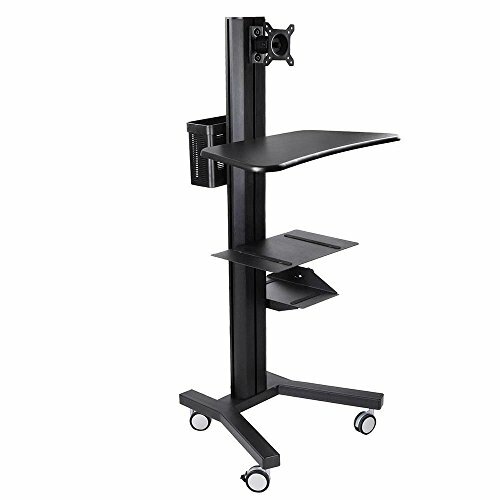 Our new all in one Desktop PC Mobile Cart allows you to put the whole set of setup including the printer. The mobile cart allows you to take in anywhere you want and get your work done. This is perfect for large buildings such as factories, warehouses, and many more places! Total Dimensions: 24.44" x 21.65" x 57.08"
Keyboard deck size: 25.39" x 14.37" x 0.66"
Printer deck size: 16.53" x 11.02"
PC deck size: 14.17" x 7.87"
Main pole size: 50.39" x 5.9" x 2.75"
Friendly note: The item will be shipped in 2 packages and may be delivered separately.